Doubtless most of us, at some time or other, have looked through an old-fashioned prismatic chandelier pendant and observed that when held horizontally it produces the very curious effect of making objects appear to slope downward as though going down hill; and certainly you have all noticed the colored border which such a pendant produces at the edge of luminous objects. 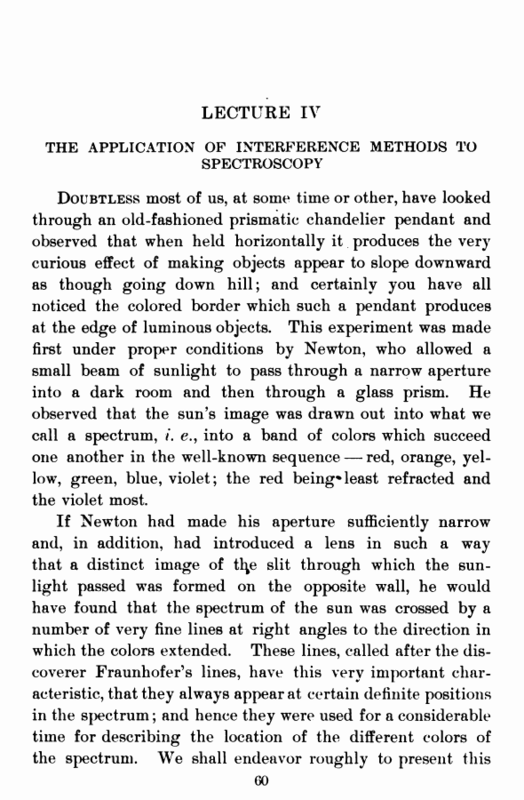 This experiment was made first under proper conditions by Newton, who allowed a small beam of sunlight to pass through a narrow aperture into a dark room and then through a glass prism. He observed that the sun’s image was drawn out into what we call a spectrum, /. e., into a band of colors which succeed one another in the well-known sequence — red, orange, yellow, green, blue, violet; the red being*least refracted and the violet most. experiment. Not having sunlight, however, we shall take an electric arc and produce a spectrum. It will be noticed that this spectrum is not crossed by black lines, but that it is, at least for our purpose, practically continuous, as shown on Plate III, No. 1. Instead of using the electric light, let us try a source which emits but a single color. For this purpose we shall introduce into the electric arc a piece of sodium glass. Instead of a spectrum of many colors, we have one consisting mainly of one color, namely, of one yellow band. This yellow band in reality consists of two images of the slit, which are very close together, as can be shown by making the slit narrower, for then the two lines will also become narrower in proportion. 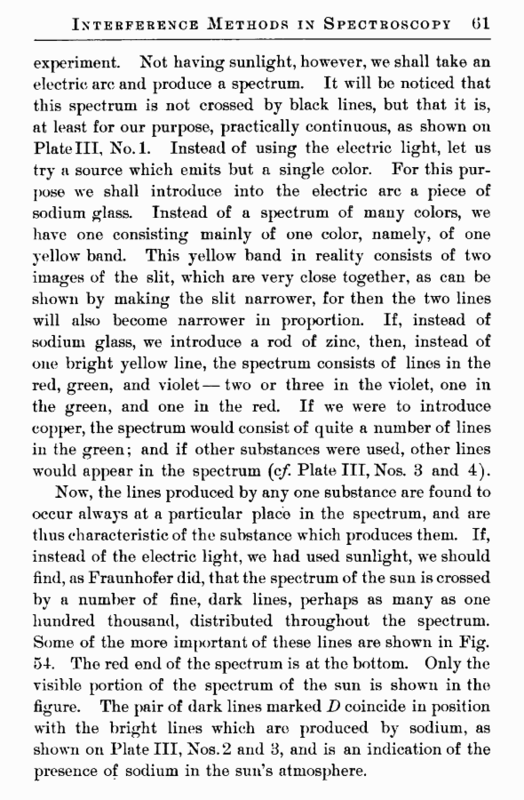 If, instead of sodium glass, we introduce a rod of zinc, then, instead of one bright yellow line, the spectrum consists of lines in the red, green, and violet — two or three in the violet, one in the green, and one in the red. If we were to introduce copper, the spectrum would consist of quite a number of lines in the green; and if other substances were used, other lines would appear in the spectrum (cf. Plate III, Nos. 3 and 4). Now, the lines produced by any one substance are found to occur always at a particular place in the spectrum, and are thus characteristic of the substance which produces them. If, instead of the electric light, we had used sunlight, we should find, as Fraunhofer did, that the spectrum of the sun is crossed by a number of fine, dark lines, perhaps as many as one hundred thousand, distributed throughout the spectrum. Some of the more important of these lines are shown in Fig. 54. The red end of the spectrum is at the bottom. Only the visible portion of the spectrum of the sun is shown in the figure. The pair of dark lines marked D coincide in position with the bright lines which are produced by sodium, as shown on Plate III, Nos. 2 and 3, and is an indication of the presence of sodium in the sun’s atmosphere.